Welcome to Gordon West Radio School! Thank you for visiting our Gordon West Radio School website! 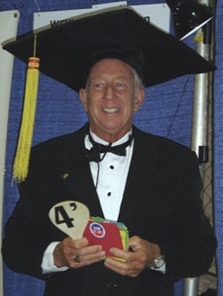 We offer the absolute finest in ham radio study training materials and VERY EXCITING weekend classes -- taught by "Gordo-Approved Ham Instructors" in your area -- that do a lot more than just crunch the Q & A's. We relate the question pool to the real world of playing ham radio, wherever you may go! I have condensed our information on this website to give you a brief overview of our upcoming amateur radio training classes, ship station licensing, and a phone number to call us so we can discuss your radio licensing and amateur radio training opportunities. ON FEBRUARY 23, 2007, THE FEDERAL COMMUNICATIONS COMMISSION (FCC) ELIMINATED MORSE CODE TESTING! This means you can take our upgrade classes WITHOUT a Morse Code Test! Click HERE for the W5YI Training Resources page where you can order any of my books, tapes, CDs, and complete radio training packages. I hope this quick review of our training resources and upcoming amateur and commercial radio classes will be of value to you. Remember... You can always contact us with your questions! "Gordo" hamming it up at the Dayton, Ohio Hamvention.